A steady new media trend in the past decade has been the shift toward increased mobility, both for users and their devices. Bulky computers on stationary desks have shrunk to laptops, tablets, and smartphones, which in turn have made possible new ways to explore the outdoors. “With crowdfunding sites, it’s usually about contributing money,” Blais said….Better, she feels, may be the websites that aim to bring people together in real life, not just in the virtual one. 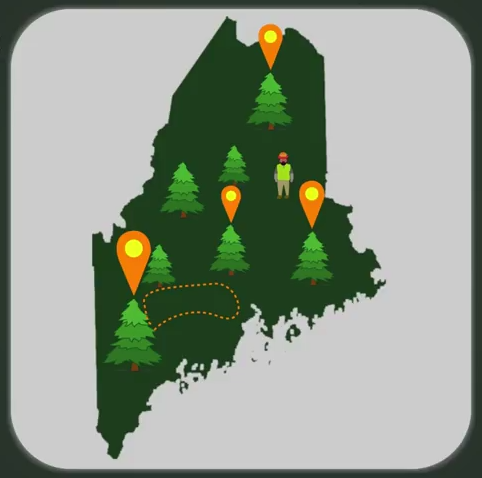 For example, some successful “meetup” groups in Maine connect people who share an interest, such as hiking or permaculture. 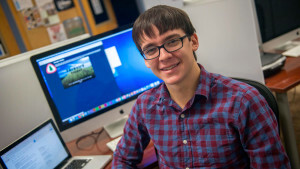 The UAV (Unmanned Aerial Vehicle) Academy envisioned by Jesse Hinman ’15 is perhaps an example. 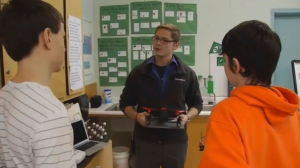 His plan for empowering ordinary people to fly drones became a reality this fall when he proposed and taught a class at Wiscasset High School, as reported in a December 17th story on WGME-TV Channel 13 (“Wiscasset students embracing first of its kind class on drones“). “Not only did I get the projects that encouraged me to learn coding, but I’ve also learned about creating good compositions with videos, editing, taking photography, creative design. I feel like basically I can go anywhere with this degree…. Photos from the top: Forestry Finder; Jesse Hinman; Matt James and Brian Rahill; Ben Brown.